Jericho is a green oasis in the Jordan Valley some 30 km east of Jerusalem, 7 km west of the River Jordan, and 10 km north of the Dead Sea. It lies 250 meters below sea level and is considered to be the lowest city in the world. 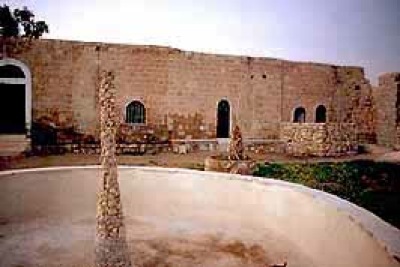 Jericho is also the oldest city in the world with some of the ruins discovered in the city being 10,000 years old. Besides its tourist sites, Jericho is an important area for agriculture and is famous for its citrus fruits, dates, bananas, flowers and winter vegetables. 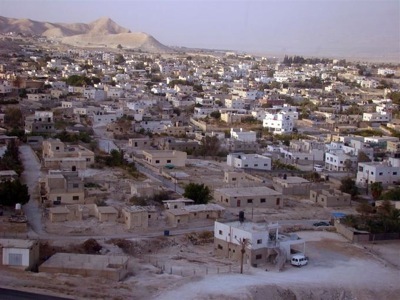 The city is also home to two refugee camps (Aqabat Jaber and Ein Sultan Refugee Camps) and the further Jericho district several Israeli settlements have been built, mostly on land confiscated from the Palestinian owners. the spot marking the ‘sea level’. 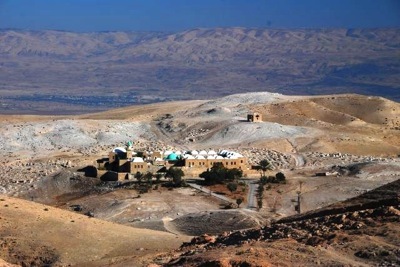 Maqam Al-Nabi Musa: The tomb of Prophet Moses lies 8 km south west of Jericho just off the main Jericho-Jerusalem road. It is a splendid example of early Islamic architecture set in an awe-inspiring landscape. The mosque is considered holy because it houses the grave of Moses according to local tradition (Moses is recognized by Muslims as one of the great prophets of Islam). The tomb has been the site of an annual pilgrimage festival or mawsim at least since the time of the Muslim leader Salah Eddin (Saladin). Until 1947, Muslims celebrated the week-long Nabi Musa festival every spring here. The huge cemetery outside the walls of Nabi Musa is reserved for Muslim pilgrims who died here during the festivals or those who asked to be buried here because of the sanctity of the site. The Oslo Accord of 1992 between Israel and the PLO placed the sanctuary under the jurisdiction of the Palestinian Ministry of the Islamic Waqf. 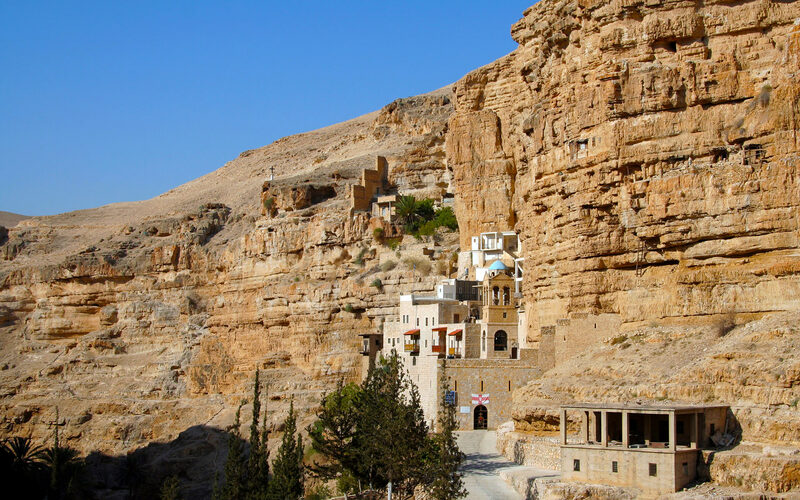 Saint George Monastery and Wadi Qelt:Greek Orthodox monastery built in the 19th Century hewn out of the rock in the Wadi Qelt, which is a natural rift in the hills with high, sheer rock walls extending 45km between Jerusalem and Jericho. The narrow and difficult road lining the Wadi was once the main road to Jericho. It is now used only by tourists visiting the monastery, the wadi, the springs, and the ancient water systems. During the Persian invasion of Palestine in AD 614, the monastery was destroyed and many of its monks were killed. Skulls and mummies of the deceased are on display at the monastery. The most spectacular attractions are the 6th century mosaics in the floor of the Church of St John. 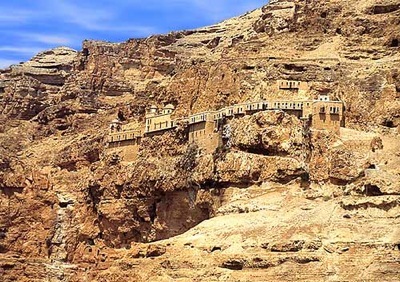 Mount of Temptation (Jabal Quruntul):The Mount of Temptation rises about 350 m west of Jericho overlooking the Jericho oasis and the Jordan Valley. 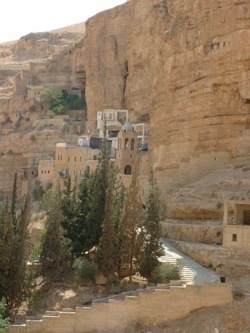 Here, after his baptism in the Jordan River, Jesus was led into the desert by the Holy Ghost to be tempted by the Devil and spent 40 days and nights fasting and meditating during the temptation of Satan (the monastery’s name, Deir Quruntul, is derived from the Latin word ‘quarantena’ meaning forty). The present Greek Orthodox monastery was built in 1895 and has Byzantine art treasures as well as a stone on which Jesus is believed to have sat during the Temptation. Tel Al-Sultan (Old Jericho): The most ancient city of Jericho is situated on a mound overlooking the oasis; excavations at the site uncovered settlements dating from 9000 BC and more than 23 layers of ancient civilizations. Visible structures include the oldest known stairs in the world, the oldest wall, and the massive, round, defense tower dating from before 7000 BC. Those finds make Jericho arguably the oldest continually inhabited site on earth. Ein Al-Sultan (Spring of Elisha): Close by Tel Al-Sultan is the Spring of Elisha, due to its output the most important of all springs of Jericho. Ein Al Sultan was called by this name because the Babylonians put out the eyes of the ousted king of Jerusalem here. 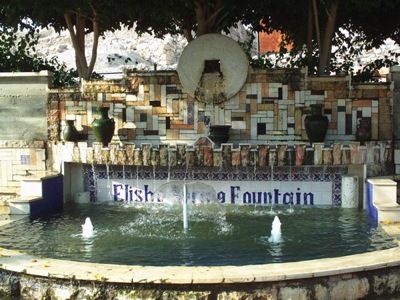 It is also called Elisha‘s well, after prophet Elisha who purified its waters by salt. Qasr Hisham – Hisham’s Palace: The extensive remains of a winter palace commonly called Hisham’s Palace because it was first thought to have been built by the Umayyad Caliph Hisham bin Abdul Malek (724-743 AD), but later rather attributed to his nephew and successor Al-Walid bin Yazid (743-744) because its unorthodox decoration is incompatible with the character of the austere, righteous Hisham. The palace is a complex of buildings, baths, mosques, and colonnaded courts. 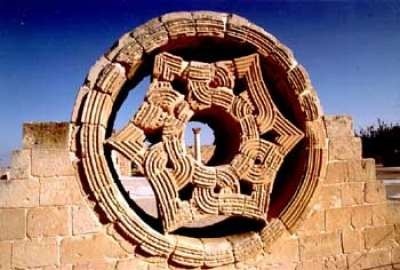 Its mosaics and stucco ornaments are fine examples of early Islamic art and architecture. The mosaic floors of the baths and the tree of Life of the guest room (also called the Tree of Human Cruelty) – one of the most beautiful mosaics in the world – are the major attraction.